The Therabath Pro Paraffin Bath is the original, and still the best paraffin bath! Manufactured to be the best paraffin bath available. 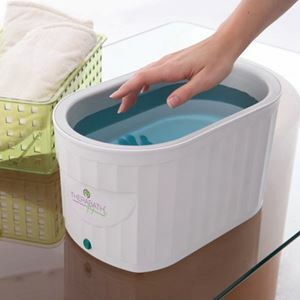 The Therabath Pro Paraffin Bath is a wonderful heat therapy that is optimal for patients suffering from arthritis, bursitis, muscle spasms, pain, stiffness and chronic joint inflammation. The Therabath Pro Paraffin Bath features: •Includes 6 lb paraffin, grille, lid and paraffin therapy guide. •Inside dimensions: 13 x 7 x 5”. •Worry-Free, Safe Melting: Slow, even paraffin wax melting. •No temperature-setting dial means you don't have to worry whether the paraffin wax is too hot. •Professional Quality Construction: Made to healthcare standards and available to everyone! •Automatic, Precise Temperature Control: Thermostatic control keeps the paraffin wax at the optimum temperature for maximum benefit •Individually Tested: Each Therabath Pro Paraffin Bath is tested before it leaves our factory to make sure the customer gets the highest quality paraffin bath available. •Automatic On/Off System: Indicated by the light on the outside, which automatically turns the paraffin bath on and off •Full-sized Inner Tank, Compact Outer Tank: Accommodates hands, feet, and elbows yet is small enough to fit on countertop •Safety Built In: Inside and outside surfaces of the paraffin bath remain cool to touch because of special construction and extra insulation. •Long-life Heating, Energy Efficient: Costs pennies per day to operate. Designed to be left on continuously so the paraffin bath is ready for use. •Laboratory Tested: Assures that the paraffin bath is germ free during a wax treatment.